Imagine coming to work only to find that the tools and services you use to perform your daily tasks have been taken away. As you look around, you see that your co-workers have everything they need to succeed. That’s how Daoud Nassar feels every day. 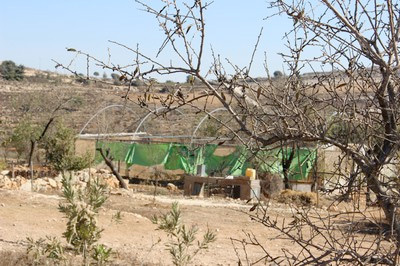 Nassar is the director of Tent of Nations, a 100-acre working farm on a hilltop south of Bethlehem in Israeli-occupied Palestinian territory. Nassar recently met with a delegation from the Presbyterian Church (U.S.A.) during its visit to the Middle East. He gave the group a tour of facilities and explained the challenges he and his family have faced over the years to keep the farm from slipping into Israeli government control. This valuable piece of Palestinian land was purchased by Nassar’s grandfather in 1916 and has remained in the family ever since. For nearly 75 years, the family worked the farm by day and slept in its caves by night, producing olive trees, grapes, wheat and other crops. In 1991, the Israeli government declared the farm as “state land,” with plans to take control of the property. The Nassar family took the government to court with the original ownership documents in tow. Twenty-three years and more than $170,000 later, the case is still undecided. While the family has staved off development on the farm itself, that hasn’t stopped the Israeli government from building settlements on the adjoining property. Lavish homes with swimming pools dot the hillsides surrounding the Nassar farm. Meanwhile, the farm has had to work with little water and no electricity. Not only has the family aggressively fought in court to keep the land, it has also worked to keep the farm in the business of growing crops. Land is confiscated if it is not maintained and cultivated. Tent of Nations grew out of the family’s efforts to keep the farm operating. Through contributions, Tent of Nations has stayed in business, allowing Nassar to reach out locally and internationally to attract organizations and thousands of volunteers to visit and work. Tent of Nations continuously hosts regional and international groups that assist with crop development or take part in educational programs. Visitors, hikers, and others have utilized the farm as an open-door classroom. The farm offers workshops and conferences, summer youth camps and classes to empower women through new language development courses or computer skills courses. Visitors learn about recycling and other environmental issues. Nassar, a Christian, said no one is turned away, regardless of heritage, and many neighbors have come to learn more about the farm and its programs, including families living in the nearby Jewish settlement. In recent months, Nassar saw many of their fruit-bearing trees and grapevines destroyed by the military, while neighbors’ crops remained untouched. And while supporters have planted new trees in their place, it will take years for them to yield new crops. The family refuses to resort to violence to confront the ongoing challenge of keeping the farm operating, saying it would only bring more violence. But the family adds that giving up and leaving is not an option. The PC(U.S.A.) delegation’s visit was a direct response to the 221st General Assembly (2014) and its condemnation of the destruction of crops owned by the Nassar family as well as its endorsement of the Tent of Nations and its work. Rick Jones is a communications strategist for the Presbyterian Mission Agency.